Well, here we are, a new year and a clean slate. That’s great news, particularly if you’re still holding onto some embarrassment about an ill-timed typo or grammar gaffe you may have committed in 2017. Fear not! Things can be different in 2018, especially if you commit yourself to developing these five proofreading habits. 1 Make a list of your personal bugaboos. What trips you up? Maybe you always second-guess yourself about the spelling of acknowledgment. Or maybe you accidentally type the wrong homophone when you’re in a hurry. Perhaps you can never quite remember whether or not to use a comma before and. Start a list of things you have trouble with and include the correct spellings, rules, definitions, etc. Make sure to keep your list somewhere visible. When you have easy access to the answers, you’re more likely to double-check what you’re writing. And, after a while, you may just find that these snags don’t really trip you up the way they used to. 2 Read it. Wait a minute. Then read it again. You probably know about this one already, but you may not always do it: before you hit send, go back and read what you just wrote. Check for obvious typos. Make sure no words are missing. Run spell-check. If you can, walk away and do something else for a little while. Then come back and read it again. The more time that passes between writing and proofreading, the better you’ll be at spotting mistakes your brain skipped over the first time through. By the way, there’s no shame in tracking the words with your finger when you go back to edit. There’s a reason kids are taught to point at each word when they’re learning to read. Finger tracking forces you to slow down and actually look at each word instead of just scanning for big words and filling in the rest by guesswork and assumption. It may sound kooky, but reading backward is an effective way to spot errors. When you’re not distracted by the meaning of the sentences, it’s easier to spot mistakes in your writing. Start with the last word and work your way forward, word by word, until you reach the beginning. This technique is particularly good for helping you spot repeated words, misspellings, and weird formatting. Do something to make your writing look different. Zoom way in so you can see only one sentence at a time. Change the font. Print it out. The idea is to make the text feel unfamiliar so that your brain is less likely to fill in gaps and blind you to mistakes. If you don’t have time to let your writing sit for a while before going back to edit, this technique can help you see it with fresh eyes. 5 Read it out loud. Shut your office door (or hide in a broom closet if you have to) and read your writing aloud. It feels a little silly at first, but it’s one of the best ways to make sure your writing is correct and clear. Take your time and pronounce every word carefully—it’ll help you spot misspellings. Also, try reading each sentence in a flat monotone. Pause only at the commas and periods. Remember, your reader won’t be able to take cues from your facial expression, vocal emphasis, or conversational pauses. Reading your message like a robot can help you spot missing punctuation and wording that might confuse your reader. Now, get out there and make 2018 the year you vanquish writing mistakes for good! 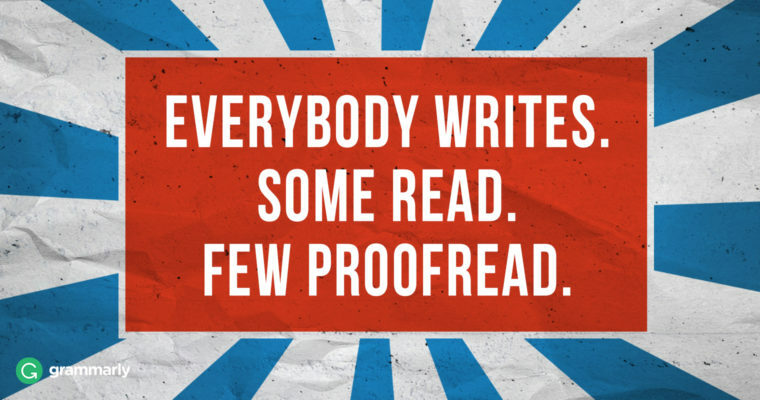 Do you have a favorite proofreading technique? Tell us about it in the comments!